Venezuela’s self-proclaimed president Juan Guaido has called for two new protests, in an effort to push the military to turn against leader Nicolas Maduro as Pope Francis warned on Monday of a possible ‘bloodbath’ in the crisis-wracked South American country. In a video posted on Twitter, the 35-year-old opposition leader Guaido announced a two-hour strike on Wednesday ‘to demand that the armed forces side with the people’. The head of the opposition-controlled National Assembly said a second demonstration, on Saturday, would be a ‘big national and international rally to back the support of the European Union and the ultimatum’ from Britain, France, Germany, Portugal, Spain and the Netherlands that they would recognise Guaido as interim president unless Maduro calls elections by 3 February. 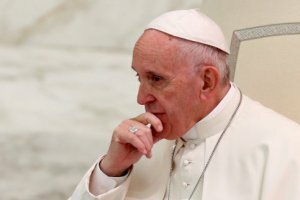 Speaking after a trip to Panama, Francis said he was afraid the escalating political crisis in Venezuela would descend into ‘a bloodbath’. He had previously called on both sides to find a ‘just and peaceful solution’. While some member nations have backed Guaido, the EU was more vague, saying it would take ‘further actions’ if elections were not called in the coming days, including the issue of recognition of the country’s ‘leadership’. Australia, meanwhile, said it ‘recognises and supports’ Guaido as interim president pending elections. And Italy has called for ‘a rapid return to democratic legitimacy’. The United States separately warned there would be a ‘significant response’ if US diplomats, Guaido or the opposition-controlled National Assembly were targeted with violence and intimidation. Maduro appeared at a military exercise in the state of Carabobo on Sunday where he called for ‘union, discipline and cohesion’ to defeat what he called an ‘attempted coup d’etat’. ‘Traitors never, loyal always,’ he exhorted the military audience. ‘Are you coup-backers or are you constitutionalists? Are you pro-imperialist or anti-imperialists?’ Maduro asked. Guaido has dismissed Maduro’s second term as president as ‘illegitimate’ due to controversial elections the socialist leader won in May, which the opposition boycotted after a number of their leaders had been jailed, exiled or barred from standing. ‘Any violence and intimidation against US diplomatic personnel, Venezuela’s democratic leader, Juan Guaido, or the National Assembly itself would represent a grave assault on the rule of law and will be met with a significant response,’ US National Security Advisor John Bolton tweeted, without specifying what kind of response he meant. The warning didn’t address specific groups or individuals, but Bolton noted in a linked tweet that Cuba’s ‘support and control over Maduro’s security and paramilitary forces’ was well known. In Washington, Republican Senator Marco Rubio, considered a key architect of the US policy on Venezuela, played down the possibility of a military intervention despite his and President Donald Trump’s warnings earlier in the week that ‘all options are on the table’.